Following the case study on photo sharing I wrote about in my previous blog post, I will now reflect on the other student activities on the Ning in our Asia-Europe WHAZZUP? project. As of today, there are althogether 216 members in the project. Since fairly good transparency is one of my aims for the project this year, I looked into all the member profiles to see how many member are actually active - the truth being that in any school project network you can make it look impressive with huge numbers of members, while in actual fact only a minute percentage may be active members at all. In our project there are 24 teacher members, 6 of whom have been totally inactive. Some of them showed initial interest in the project, but possibly realised later that they couldn't participate with their students after all. Some, on the other hand, joined at the request of an active colleague, but as observers only. Out of the 192 student members, 27 seem to be totally passive, which represents about 14 % of all the students. Some of them have absolutely no activity after signing up, while others may have changed the layout of their profile page, or simply added a profile picture, but nothing else. In reality then, we have 18 active teacher members, and 165 active student members, adding up to a total of 183 active members. long tail of members with only minimal participation (cf. power law). One of the features on the Ning site, similar to Facebook, is wall comments. Each member has 'a wall' on their profile page where others can leave comments for them. Today the total number of wall comments in the project is a massive 3379. At a closer look, there are 31 members with zero wall posts (more than the totally inactive members, because some without wall posts have, nevertheless, contributed in the discussion forum or blog or uploaded photos). The power law long tail seems to apply here, since including these zero wall comment members, there are 126 members with below 10 wall comments (ie. 58 % of all the members). One students has an amazing 215 wall comments, but all in all only 3 members reach 100 comments or above. Naturally, the mere number of wall comments is a very limited measure and calls for more qualitative study of the interactions on the Ning site. An interesting topic for further research would be, for example, how and how much the different members are connected, or whether most of the wall comments are casual everyday chit chat exchanged between already existing friends in the same school. From the point of view of educational value of the project (eg. learning valuable skills for intercultural understanding and communication), a lot of interaction between students from different countries would, of course, be desirable. Then again, there is no denying that learning can take place between classmates in such networks, too. For example, as I have already mentioned earlier, most students in the project use English as a foreign language, and thus practise their language skills even with their own friends, since we only allow English being used on the site. Apart from posting on other members' walls, the Ning features include a discussion forum and a blog for each member. The discussion forum can be accessed from the main page of the network, and there each member can start discussions and add comments to existing ones. Each member has a My blog feature on their profile page, but all the blog posts will be added into one joint All Blog Posts feature, which, at least in my opinion, is a little confusing. What I would like is a feature to allow grouping blog posts into different subgroups, for example. There is also a group feature on the Ning, but the groups don't have their separate blogs, which I would find a good idea. Something to suggest to the Ning team, I think! The blog posts can be tagged, but I must say that being still rather unaccustomed with using tags, myself, I didn't think to guide members to use them. Some students have used them, though, but not always so successfully (eg. tagging something with 'the' must be a mistake!). The discussion forum allows for setting different categories for discussions, but unfortunately I only realised this feature too late. Ning doesn't allow the network creator to add categories to discussions started by other members, which in our case would have been useful to keep the discussion forum under better control. As it is, it is rather cumbersome to go through all the discussions trying to find what you want. Next time, I will know better and set the categories in advance, as it is rather predictable what discussion students are most likely to start. 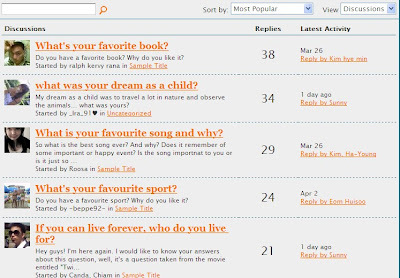 Five years ago I did a case study of a project discussion forum and found out that, if students can freely start discussions, they are mostly about freetime activities and hobbies (movies, sports, books, holidays, , school and country info (climate, weather, famous places, languages, food lifestyle). Looking at this year's project, I would say these categories still apply, so in my next project Ning I will definitely organise the discussion forum into categories in advance, probably setting an open 'Other' category not to restrict students' freedom too much. The number of blog posts is almost the same - 63 as of today. However, I must add that students seem to find it extremely difficult to differentiate between blog posts and forum discussions and I have had to keep reminding many of them of what we expected from the blog posts. Despite our guidelines, referring students to them and asking their teachers to keep reminding them, I would say there are at least 16 blog posts that should actually have been posted in the discussion forum, or alternatively on a member's profile page as a self-introduction. 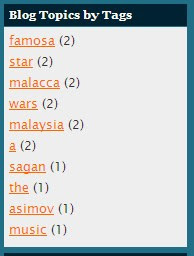 Compared to the replies to discussions, blog posts have only attracted 66 comments, and a total of 24 blog posts have no comments at all! Clearly, this is a weak point in the project. The most popular blog post, judging by the number of comments (14), is also the most impressive, innovative and creative one, in my opinion. It is a group effort with several products about the European Union by students at the German school of Paris. The products are PowerPoint presentations or even one quite funny student video. It is wonderful to have such excellent work showcased in our project, but although the students have made the effort to write replies to the comments to their work, they haven't participated in any of the other activities of our project. The same occurred with some my own students, who I gave the chance to do some of their regular course work in connection with this project. Disappointigly, after posting one single blog post they weren't interested in participating in any other way. 2) those who had the chance to choose joining up as either an optional course, extra-curricular activity or independent study. Unsurprisingly, it can be noted that all the totally inactive students belong to the first group. Motivation to participate in this type of project is paramount, and a prerequisite to help a student become a self-directed lifelong learner. Of course, there are motivated students also in the first group, but it is clear that no unmotivated student would join a project voluntarily. All along they have tried to help each other and try to learn collectively, which I have never seen among my students in my school in Finland! In an earlier post I wrote about a student member from Malaysia, who also made the effort to join our project quite independently, and has since decided to try to use his active participation as credit to be accepted into a student exchange programme. These examples raise the question whether the easy life most western European students are used to makes them rather complacent and unmotivated to study, since it often seems that for them studying no longer represents a stepping stone into a better and wealthier life. Life is more about instant gratification and having fun, where boring old school is a chore they are forced to endure. In such an atmosphere, even project work becomes yet another boring chore of 'schoolwork for school and grades only' or 'because the teacher tells us to do it'. How then to spark the inner motivation of these students to be active learners and directors of their own futures? Just today I read this interesting blog post, which refreshingly focuses on the positive value of social networking for students rather than highlighting all the dangers in them. My next challenge will be to convince my students of the positive value of being pro-active about their future by starting to create their professional digital footprints as early as possible. One of our aims was also to guide students towards more professional writing, and also writing to an audience to start interesting conversations that would facilitate collective learning experiences. Sadly, this has hardly occurred at all. True, not all learning is clearly visible and can be hard to assess, but still, I can't help feeling rather disappointed at this result. In hindsight, I feel that our idea of allowing students freedom to express themselves in the project has resulted in trivial quantity over quality. On second thoughts, though, I strongly suspect whether limiting wall posting and demanding more homework-style blog posting would have lead to any more interactions between students. They are simply not used to constructively commenting on other people's writing and building deeper dialogues. Maybe this is partly to do with age and maturing? Yet, I don't think we teachers should give up our goals of guiding students into more mature and professional online communication, maybe we only need to be a bit more down-to-earth and realistic with our expectations. Another factor to keep in mind is different school realities. Not all teachers enjoy the kind of autonomy we Finnish teachers have, nor do all participating students possess adequate enough English skills for anything much more than casual everyday conversation. Learning from all of the above, we have come up with two new activities to develop the project activities. The first one (already mentioned in my previous blog post) is the photo quest activity that has now been officially launched. Our goal here is to create a type of 'community art' by students really looking into the wealth of photos uploaded by all the members and then creating their new products with them. I am truly hoping for keen participation in this activity! The second activity will be an environmental unit that I and my colleague are teaching in one of our English courses. We will do it partly on this project Ning by opening up the course activities to an online Asia-Europe classroom of interested students. I am curious to see how many (if any!) international students take up this opportunity. Designing motivating activities for this is my next challenge.